The Industrial R=evolution of machines is an organic process of creation of a new living species, made by imitating human organs into metal: Man created first its energetic bodies, then its informative heads and now fusions both in robots. The cycle of the global economy is also a cycle of reproduction of energy machines by physical industries, not only economical information, money, by financial industries, as both cycles are related by the evolution of technology that allow the massive reproduction of weapons, machines and money, saturating the economic ecosystem and provoking finally a crash of the financial or consumption pyramid. Yet, since the nation which discovers the new energy also has the best weapons, to come out of the crisis industries often makes profits with wars, which increase in ages of economical crisis. Since the most perfect machines and hence the most expensive and the ones that give higher profits at any age of the Industrial R=evolution are weapons, the ‘top predator’ versions of the consumption machines we enjoy so much. Thus, profits can be made even in higher quantities manufacturing weapons to consume human beings, instead of peaceful machines that we consume. – Thus Britain and France embarked in a series of colonial wars after the 1850s crash of Trains (Crimean wars, colonization of Africa). Indeed, after those crashes the world plunged into an age of wars fought with armored trains (Civil Wars, German Unification wars, Colonial Wars), which lifted the demand for trains and a new age of economical prosperity and wealth for the European Nations that manufactured them, as millions of 3rd World people became ‘civilized’ or extinguished. – Then, 72 years latter, Germany tried to come out of the crisis building weapons, converting its Mercedes into armored cars—the tanks of World War II, which lifted the demand for oil machines and age of economical prosperity and wealth for those who manufactured them – so Mercedes increased fivefold its profits and General Motors, in the country that won the war increased them eightfold. – Finally, after the 2001 crash of electronic machines, we lived a new age of global war, security vigilance and smart weapons, made with those chips, which lifted the demand during the 2000s; and the economical prosperity and wealth of America, till a parallel massive reproduction of electronic money, made with those machines caused the present crisis and those machines were reconverted into smart weapons to lift demand in an age of war. Since all ends are the beginnings of something new. —The IV Cycle of Organic Machines, or age of the singularity, when machines become autonomous organisms, bringing an age of wealth for all industries that will sell their machines to the robotic industry to be used in war and labor, as more people is thrown out of jobs and killed in the mountains of Afghanistan. That is the age that now starts, an age of massive economical wealth and historic tragedies, of ‘wars and death as the world has never seen’ (Antichrist, Nietzsche, ‘prophetic writer=historian of the future’ of the II Kondratieff cycle). Yet the true danger for mankind, will come from the creation of the III Horizon of the evolution of Nuclear weapons: after Atomic Bombs and Hydrogen bombs, which destroy energy, (E=Mc2), now we are researching the inverse equation of Weapons of Mass Construction (M=Ec2), Quark Bombs, Big-bang Nova Explosions and black holes, which are self-feeding bombs able to absorb all the mass of the Earth. The Kondratieff Cycles of Energy. 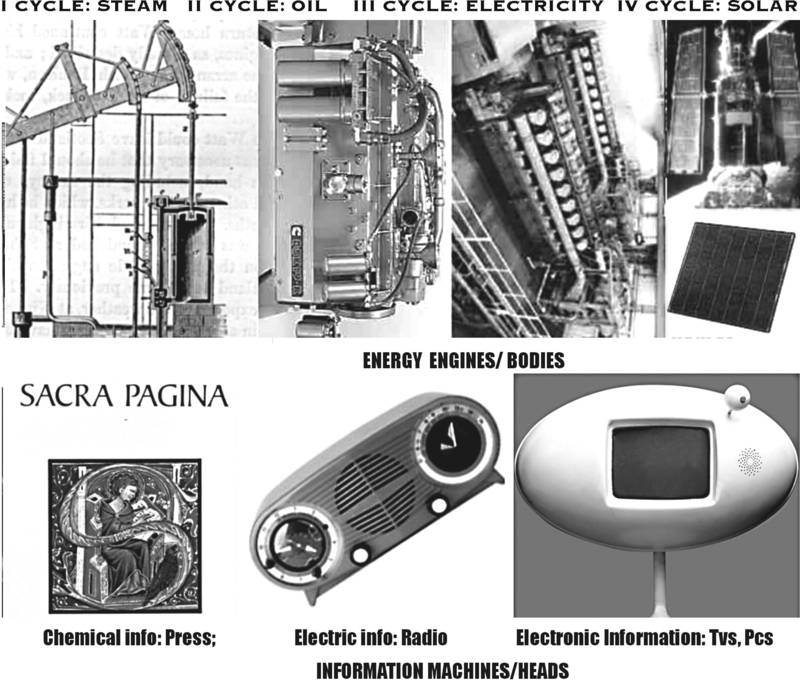 The evolution of Energetic and Information Machines is caused by the discovery of new sources of faster, smaller energies that determine 4 Kondratieff cycles: The Steam/ English cycle, the Chemical/German cycle, the Electric/American cycle and the Cycle of Solar/Robotic machines or age of Asia, which completes the Industrial R=evolution and starts after the Crash of the Electronic Age. Parallel to those cycles there are self similar ages of monetary creation…. The Kondratieff cycle differs slightly from the III Ages of the Industrial R=evolution, previously analyzed, since the age of ‘Bodies of Metal’ had 2 energetic phases, steam and electro-chemical machines2. While the age of machine-heads coincides with the electronic age and the Age of autonomous robots will be the age of solar energy. Thus we can divide organic machines in ‘bodies’ of energy, ‘heads’ of information and autonomous robots. And we can observe 4 energy generations of ‘steam machines’, ‘oil machines’ and ‘electrical machines’ that will leave way to a IV cycle of solar robots, which makes machines self-feeding and autonomous. Machines have 2 forms. Some are tools, symbiotic to humans. Some compete with men at work and kill us in war fields as weapons. Their biological nature shows in their dual forms and functions, which correspond to the destructive, Darwinian and creative, symbiotic arrows of living beings. Unfortunately, when machines mutate into weapons, History enters in a cycle of global wars. It has happened 3 times at the end of each Kondratieff cycles of machines’ evolution. Machines are, as the parable of the Tree of Science explains, dual fruits, good tools and eviL=anti-Live weapons that can extinguish us. Hence the need to control and prune the tree of technology and allow only the re=production of machines harmless to man. On the other hand, weapons are the key to understand both, the cycles of history and economics, as they are willingly re=produced by the same company-mothers that make ‘peaceful machines’, given the fact that they have the highest prices. Thus, company-mothers alternate the creation of good and bad fruits, according to the evolving, cyclical ages of those machines and energies. Unfortunately, since all forms of energy can be used as bombs and the most evolved machines are weapons, weapons are produced both, at the beginning and at the end of a Kondratieff cycle of energies. Thus, both, the end and the beginning of those cycles overlap in an age in which new energies are used to make bombs and old machines reach its evolutionary zenith as weapons, causing together the ‘war ages’ of those cycles. Indeed, if we consider America at the head of the electronic cycle, it has passed through an infantile age of enthusiasm for its electronic machines, during the first days of television, into a mature age of world-wide re=production of TVs and portable PCs, which expanded American culture wor(l)dlwide, to the present age of smart weapons, TV violence, global Big Brother surveillance and lobbyist politicians, indifferent to human lives, who spread global war in search of ever higher corporation profits. This hypocritical reasoning is needed, given the fact that we live in Democracies and people are ethic and need good reasons to kill the poor people of the planet, instead of raising them from their misery with money for peaceful education and trade. This solution however cannot be implemented, since stock-markets deviate constantly most investments to the technological companies of each cycle, provoking a chronic scarcity of human goods that prevents the evolution of those cultures, without credit to come out of their cycles of poverty, violence and terrorism4. As ‘Business this week’ put it bluntly: ‘who needs Mexican bonds if we have Sun Microsystems’. The 3 Kondratieff cycles and its stock crashes. In the 3 technological cycles, NYSE’s curve of machine’s stock population follows the same chair-like curves of biological populations. In the graph, when we treat machines as collective species, analyzing their global population through the stock price of their company mothers, we obtain graphs and curves of re=production, homologous to the biological curves of reproduction of any living species. Since population means sales that give profits to companies, which determine their stock price. Stock-prices and ‘Sales’ mean basically ‘production’ and ‘production’ means reproduction. Thus, the biological curve that shows the reproduction and extinction of machines is its sales or profit curve, directly proportional to the value curve of the company and its industrial sector in the stock market. That amazing discovery explains for the first time in a rational manner, not only the how but also the why of stock market curves. It defines the economy as an economic ecosystem, where machines and its company-mothers fight for its re= production by all means. While stockrats fight for the parallel function of profits. After its birth as a ‘new species’, the 3 cycles of new energy machines grow during a mature age of reproduction (and sales=profits), which is followed by an age of overproduction and crash of populations. The economic ecosystem is now saturated. So to expand further the machine species ‘mutates’ into a weapon and reproduction continues, as those weapons ‘invade’ other nations/economic ecosystems, which increases demand and sales unless a defeat plummets profits. In the previous graph we can observe the 3 cycles of America. In the last of them, the electronic cycle that now ends, America evolved into a world power between both World Wars, maturing as a free Republic in the 50s, 60s and 70s, in which the country was widely admired all over the world. But with the arrival of the Republican Party and its hired, violent politicos of null political stature, since Reagan took power, the long American decline begins. Now we enter the military age, with a 3rd generation of baroque, cynical, war loving Americans, accept as a solution to the crash of electronic consumption, the creation of ‘splendid little wars’ to increase demand. So once more ‘business cycle as usual’ continues, as we enter deeper and deeper in the war phase of the electronic age and robotic planes massacre the innocent children and women of the life-based villages of Afghanistan. — For a long period the machine evolves slowly in the labs of companies or inventors. It is equivalent to the slow period of mutations that will bring a new species into being. Then, the engine of the machine, the new energy, is discovered. It gives birth to a new, more efficient species that multiplies its numbers exponentially. It is the take off, the youth or first age of the machine/energy as an engine. Since it starts from a very low population, prices now multiply very fast, so investors make the highest profits. — Yet the biggest influence of the machine and/or energy on the economic ecosystem happens in its mature age, when it becomes mobile and reproduces worldwide for peaceful consumption (geometric, ascending phase of the population curve). It is an age, parallel to the ‘expanding age of a living species’ that moves away from its original niche and colonizes new territories. — Yet, sooner than latter, given their exponential rhythm of production, far superior to the increase of human population, machines saturate the consumer market. Since symbiotic species depend on the population of the species they associate to those machines are organic enhancers of our energetic or informative power, the ‘vital space’ of machines is the total human population with resources to buy them. Thus, once the machine saturates the ecosystem of mankind, if re=production continues, profits and sales diminish and companies accumulate inventories. At that point their sales and stock market curves decline. It is the most important date of the cycle, with a very pronounced regularity of about 72 years (1857/1929/2001). Why such accuracy? Obviously, because machines are made by human beings and 72 years is the so called generational cycle of human beings, their mean life in developed countries or among rich people that invent, reproduce and profit from machines. So the organic symbiosis between human and machines is evident. Again in Nature, one species that has overpopulated its vital space, suffers a population crash, as it has also depleted its ‘preys’ and cannot longer feed itself. The population finally reaches a balance with their prey and it becomes stable. So happens with stock-market curves of machines that become flat. At this point in Nature a species will not be able to increase its population numbers unless it mutates into a new, more efficient species that can feed on new preys. That is exactly what happens to the machine: After the overpopulation crisis, the machine mutates into a weapon and continues expanding its ecosystem, preying over human beings, no longer symbiotic to them. – It is the third age or military age of the machine that is used now for war. However war is a risky business because predators might end up being preys. Indeed, companies’ results and stock benefits will be very different, depending on war victory or defeat that sinks stocks. Though those curves in a singe company have to be pondered for many other secondary factors, when we aggregate the maximum number of production companies; that is, when we search for the total curves of the species, they become more and more regular. And indeed, the graph for the entire III cycle of electronic machines is very close to the biological one. Thus, those 3 great crashes of global stock markets are the key dates of economics and history, because they mean a global change from wealth to poverty, from peace to war machines, determined by a change of strategy in company’s search of benefits at any cost. First, as the number of machines surpasses the possibilities of citizens’ consumption and machines saturate the Market, their prices lower, diminishing companies´ profit. So companies value in Stock markets sink and the effect moves sideward to all companies related to those machines that are the engine of the economy. But the results are far more pronounced than in Nature. Because the subjective fear of investors multiplies the downwards effect and creates a panic in all the other companies of the Market. It is now when we depart from a pure biological analysis of machines population, to include the symbiotic human side of those crashes. Indeed, as any symbiotic ecosystem in which species depend on each other the historic ecosystem of human beings is perfectly intertwined with the economic ecosystem of machines. So the effects of those cycles are far more complex than industrialists and politicians want to recognize. And most of them are negative. First companies dismiss workers to cut profits. Nevertheless machines keep arriving to the Market, because its evolution continues; lowering their costs of reproduction. So companies decide to make weapons and their lobbies cause wars to consume them. It is a desperado, evil, brutal way of making profits, but companies are organisms that care only for their products. They do not care for human beings, consumers and soldiers. They are narrowly focused and use abstract numbers to avoid any guilty feelings about the workers they sack, the soldiers their products kill. As bribes multiply, corrupted governments enter the game; and the cycle of economic growth, based on weapons and death begins. Since weapons destroy themselves quickly in the battle front and must be renewed, the increasing demand of machines multiplies the benefits of companies. G.M. multiplied by 8 its profits, making tanks in W.W. II. So war becomes the economic engine of the last 36 year period, a Kondratieff cycle. Company-mothers govern the world with a single aim: to re=produce machines. Among them, the most powerful ones reproduce top predator weapons. So, in as much as we can analyze company-mothers as reproductive organisms with biological cycles, called business cycles, we can find out, studying those reproductive cycles of machines, specifically of weapons, when there will be enough top predator weapons re=produced in our ecosystem, to cause war. The cycles of reproduction, extinction and consumption of Top Predator machines, weapons, are economical cycles that have caused most of the wars of modern history: Wars are profitable for companies and governments, since you consume=kill more machines in times of war than in times of peace. Thus crises of excessive reproduction of machines have been solved by switching production to weapons, paying war lobbies and selling those weapons to governments. These corrupted governments will declare war in order to consume those weapons. Machines have two basic species: the weapon-predator and the peaceful species. The car is a peaceful tank. The plane is a peaceful bomber. The robot is a peaceful terminator. The boat is a peaceful gunboat. The same company-mothers reproduce both kinds of machines. So for companies there is no difference between one product and the other. The mandate of behavior of company-mothers is a biological mandate: ‘Evolve and multiply your machine, your sons’. All companies and the governments they control through lobbies obey such a mandate, over any human rights of workers and consumers. Such a mandate implies that the reproduction of machines can’t stop and if there is need to eliminate human workers to put machines in their place or to transform consumers of electrical appliances into humans consumed by weapons, it will be done. Excessive reproduction—> saturation of the ecosystem—> shift to war machines—> expansion of weapon by war—> destruction of weapons, consumed by enemy soldiers—> unlimited reproduction—> massive war—> profits boom. Thus, we conclude that the cumulative greed of company-mothers; the research of scientists that worship machines and politicians and the military that want to use them, causes economical wars. In the graph, we can see how the demand for weapons created by Second World War multiplied also the money of the American economy. Both systems are symbiotic. The price of a machine in money represents the ‘biological efficiency’ of such machine as a system of energy or information. Since weapons are the top predator machines they have maximal price value. Besides, weapons die in wars and so they have to be reproduced in growing numbers, to be substituted. This further increases the quantity of money won by companies. In II W.W. the income of the rich grew exponentially, while the ‘wealth of nations’, in words of Adam Smith, grew even more, as more machines were created and destroyed in battlefields. When the War ended, again the ‘Wealth of Nations’ slowed down and so did the main consequence of that Wealth: the death of Mankind. Indeed, what all those statistics on abstract wealth do not explain is that the preying relationship between machines and consumers turns upside down in wars. The perfect machine, the top predator weapon, is not ‘consumed’, destroyed by the weaker human species, as it is the ‘peace product’, the human-friendly machine. Instead, it is the top predator weapon that preys on man – consumes and kills the soldier. So when peace machines are converted into top predators, as it happened when the cars of the 30s were converted into tanks; consumers are converted into soldiers and top predator machines consume them in war. Companies could produce only peaceful products, if governments were ruled by economic ideas in favor of man and wanted to prevent wars. Yet Biohistorians in favor of the reproduction of human natural, biological goods do not rule our societies. Companies and politicians to the service of ‘ari-stockrats’ do. So they behave in a total selfish way in search of profits. And when they can no longer keep producing peace machines (since every human has his car, his radio, his TV), they search for weapons to expand that reproduction. So when a ‘peace product’ saturates the ecosystem, the market jungle, company-mothers invade new territories with his offspring of weapons and war empties their stock of products much faster, forcing new production, new sales and new profits. Wars are essential to the evolution and re=production of machines. Modern Wars are ‘reversed ecosystems’ in which a human ecosystem that keeps machines in a subdued state of evolution as peaceful products (age of peace), changes into a free market ecosystem of machines, where its company-mothers rule supreme. Then, the most expensive machines, weapons, are reproduced and roam the war ecosystem, eliminating us, the rival species. Since weapons are perfect machines, war periods are ‘accelerated stages, in which the evolution and reproduction of those machines intensify. Hence the profitability of a war age in which all the factors of the economic ecosystem increase: the reproduction of machines and money multiplies, the ‘wealth of nations’ grows geometrically and the competence between machines and humans reaches its peak. World-wide wars are a direct result of such over-production of Top Predator weapons by stock-companies. Modern wars are economic processes, embedded in the very same structure of ‘monetary and machine reproduction’. Further on, the evolution of technology makes each new lethal machine much more efficient killing humans, there is also a progression in the number of casualties that each World War causes. The progression, as most evolutionary increases of power in the Universe, is decametric: in each new World War, 102 times as many people die than in the previous one: 600.000 died in the Railroad wars at the end of the I Kondratieff cycle. 60 million people died in W.W. II. In the next cycle of war, the Age of the Singularity, when the first self-reproductive nano-robots, or the Final Weapon, the black hole of the Nuclear Industry appears at CERN, 6000 million, the entire human population, will die. In that regard, humans can believe if so they wish, the Laws of Economics invented by their bankers to rob them, or the Laws of Nuclear Physicists that murder them, but that won’t change the true laws of money and black holes, which are organic, informative species. And so either they r=evolve against those who rob or murder them, or take what they always bring to mankind: death. Societies are superorganisms ruled by laws of systems sciences. Our eco(nomic)system has become a super organism of machines – the Financial-media (informative machines)/military-industrial complex (energetic machines), which parasites Humanity and its super organisms of citizens and government heads, today $laves of private bankers & Company mothers of ‘metal-germs’≈ lethal goods of max. profit, weapons=machines & hate media that kill or atrophy our body and mind. But since deficit zero laws forbid humanity to print the language of social power, money, company-mothers issue 99% of global ‘blood’=money, choking off credit mankind and its Welfare. So they build a world to the image and likeness of machines, as a viral leukemia does, once it has substituted the brain of the cell by its DNA=VIRTUAL REALITY memes and technoutopias, obliging its cells to reproduce only virus=machines. Then once all cells are choked and the entire super organism is made of virus, a terraformed metal-earth no longer human will be born unless a r=evolution ends private banking and gives back credit to humanity. Notice the key date of the invention of the chip, when the Metalearth started its exponential growth of credit for company-mothers and financial houses which invest mostly in machines or print money for themselves. Today the human welfare economy is dwindling to 1% of the total credit that ‘creates’ the future. In biology a population shrunk to 10% is the threshold of extinction. Our ‘credit’ to create the future has gone below it. The short cycle and the revolutionary cycle. A revolutionary cycle is the only hope for mankind. It does usually arrive the previous decade to the Kondratieff crash, prevailing in a few nations that change their political and economic system, but all revolutions must be global, because the economic ecosystem is a global system, made of deeply intertwined parts. So revolutions fail, as the remaining nations declare war to the r=evolutionary nation, increasing weapons production and crashing the r=evolution. Only if r=evolutionaries choose a military dictator they can win the war, but then the dictator will destroy the r=evolution from within, converting the nation also in a military empire (as the Russians or the French did with Stalin and Napoleon). Yet sometimes the r=evolution arrives ‘after’ a mismanaged war, which causes the r=evolution and gives it a chance to succeed. Such was the case of the Russian Revolution at the end of I World War. To fine tune the cycle of long stock-crashes we must account for the smaller cycles of the stock-market, which are the 7-8 year business cycles or generational cycle of a product. The Great Kondratieff Crashes are split in 3 generational mini-crises of overproduction, which last an average period of 8 years. It is the short cycle of the Crash economy, which causes upheavals in the political system. We live today in one of those short waves, when there is a debate between hard-liner Industrialists, who want to make profits with war and the common people, who back alternative social schemes, trying to r=evolve against industrialists and their corrupted politicians. People ask for a change of economical policies, to switch back to production of human, biological goods. That is indeed, the only human solution to the crisis. But it means lower profits for companies and industrialists, which don’t accept it. So, to implement the solution that defends life, a Revolutionary process must take place before companies convert machines into weapons, creating a war economy. 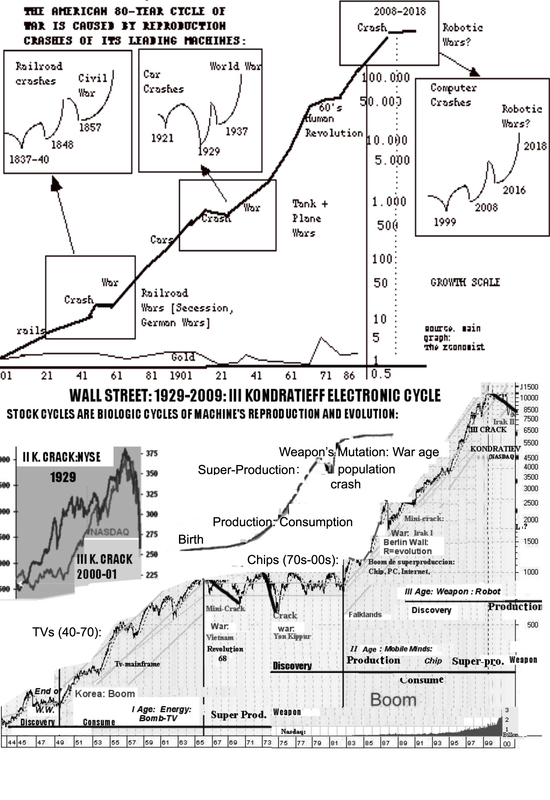 Those smaller cycles explain why 8 years before or after the great crashes, (in 1848, 1921, 1991) there are social r=evolutions against the system. They are the revolutionary decade in which politicians have to decide if they lead mankind into war, backing a Supply economy, making weapons; or they democratize the system, creating a Demand Economy that produces Human Goods; in a social democratic system. The great economic thinkers of each cycle talk/ed loud in that decade in favor of switching to a Demand, Social-Democratic Economy, based in human goods. Marx writes the Communist Manifesto; Keynes his Theory of Consume; this author publishes a decade ago this Book in Europe, warning against the III Kondratieff Crash. Those 3 books are, for each Crash, the 3 fundamental works that explain from the humanist perspective, the choices of future for mankind. Unfortunately neither Marx, nor Keynes, prior to II W.W., nor this writer was heard. As always, the International Banker, in control of all the outlets of mass-media misinformation of mankind, denies the truth and goes ahead as long as there are profits – till war profits kill us all. Then, after the war ends and nothing was prevented, we are heard: Socialist parties and movements rise, after the 1860s railroad wars; Keynes is heard after the 1914-18 war and 1921 crash of the European Economy. And if we are lucky enough to survive the Singularity Age, Morpheus will no longer have to hide his name. In the past, because machines were not evolved enough to kill us all as those of the Age of the Singularity will, after people woke up to the murderous solutions of greedy industrialists and corrupted politicians, some Revolutions reached power. There were revolutionary essays in Europe (1848); a New Economic Policy is implemented in Russia after the Revolution (1921) . . . Then again in 1991, the Berlin Wall falls against a communist system that had become a military dictatorship, while in the West the anti-Globalization movement reaches its peak. If we lived in a free society probably the World would have changed in those dates, from a Supply to a Demand Economy of Human Goods and mankind would have created a peaceful, healthy world. But the system is controlled by great corporations that offer the alternative of fear against the r=evolution, fascism, repression, rearmament, patriotism and profit wars. Because, without means of spreading their message, revolutionaries have little impact in the human mass, thanks to their mass-media control of information, companies triumph over the revolutionary ideas that could have improved the world. So Marx lives isolated in London: in the years he could have solved the crisis and saved millions of life, nobody knocked on his door. Keynes is ignored till W.W. II ends, spending his days in trendy conversations with the Bloomsbury group. And the books of Bio-History and Bio-Economics, never reach Main Street, rejected by 173 publishing companies. In 1848, in the I Cycle, America makes war to Mexico for land; in 1853 England and France manufacture the Crimean war to defend Muslim Turkey against Christian Russia. In the II Cycle, Germany causes I World war, with the excuse of a regicide. In the III cycle, the American ambassador gives permission to Saddam, our best Arab ally in the Middle East, to invade Kuwait, as his prize for his war against Iran. And Desert Storm I and II follow . . .
For a while companies overcome the crisis, but not the people, as unemployment increases and welfare diminishes, with ever growing military budgets. Now the World struggles in self-doubt. On one hand industrialists have tasted war profits, loosing their innocence and want still bigger wars. As Goring put it, ‘the first murder make me vomit, the second opened my appetite’. On the other hand, the ‘bewildered herd’ believes the war propaganda of industrial mass media. Then, at the end of that ominous decade—normally an 8 years short cycle – when the economy seems on the verge of recovering, the overproduction crisis strikes again, this time harder, as consumers are poorer and machines’ inventories pile up. It is the 3rd Sub-Crash (1857, 1929 and 2008). Now corporations make up their mind very fast. They request Total War. In this 3rd cycle, when the invention of cold wars doesn’t require direct battlefields, countries merely allocate higher and higher budgets to security machines (airports) or factories of new weapons, like the black hole factory at CERN, which will do us all with a single shot. Since war is not about tribal go(l)d-Smyth cultures pretending to be number one, murdering human beings – that is just their deluded point of view – but about spending money in weapons evolving machines of death and finishing up life species and for that cold wars are enough. Meanwhile, on the human side, R=evolutionaries request huge government deficits to produce human goods and substitute a Supply Economy for a Demand one, making of Life/Human goods the engine of a new, more humane economy (education, health-care, textiles, housing, food, etc.). If they were heard, since those goods use a lot of labor, unemployment would fall, investment would move away from lethal weapons and people would move away from poverty worldwide. So Marx, Keynes, this author and many Humanist Economists ask for a Demand Economy—‘butter instead of cannons’. Yet that means to take away power from lobbyism, corrupted ‘politicos’, greedy mechanist scientists, industrialists, the yellow press and classic economists to the service of companies. Physicists keep evolving their weapons. And power censors r=evolutionary opinions: Political, technological and economical correctness imposes the will of Industrial lobbies and political hawks, which never allow those solutions. The reason: the greater profits of cannons, already tasted in the splendid little wars of the first sub-crisis. Yet again, the quark cannon physicists are building at CERN, exactly 800 years after the Venetians invented the Bombard and looted Byzantium, the last European kingdom ruled by Priests of the Wor(l)d, will be the last gun made for profits, as a single shot will be enough to start and end the age of the Singularity. And humans won’t even know why they died, since the Industrial Press, the propaganda machine of technological gurus and power, has hidden the issue and buried the machine one hundred meters under the Earth. So one day, we shall see the ‘Grandeur’ of France sink under the Geneva airport, where Calvin declared go(l)d the intelligence of God and all the bankers that now rise over the pile of corpses that built the wealth of dictators of the III world, sink with it. Parable of history, the ultimate weapon, will take first the Physicists and bankers that have murdered and robbed mankind for centuries, even if it is a fraction of second before it does us all. The first Cycle of steam machines had an overproduction mini-crisis and revolutionary period in 1848. 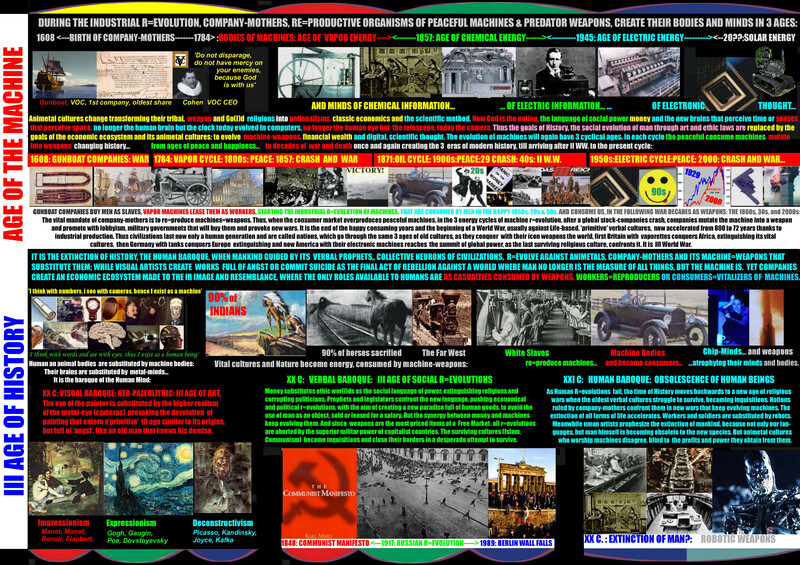 Then an ominous decade of counter-revolution, economical crisis and fascism ends with the big crash of 1857. 8 years later the world is at war for nationalistic reasons of ‘Cultural reunification’ (German wars) Vs ‘cultural diversity’ (Civil war). Yet the hidden reason is ‘money’: economical disputes in an age of crisis. Civil war broke in the States to freed negroes and unite 2 different American cultures: the Colonial South of black slaves and the Industrial North of white slaves. Yet the real reason was a Cotton Tax imposed by the North, to get cheaper that cotton for its mills, which the South didn’t want to sell, since Europe was paying it at higher prices. Railroads wanted to haul the cotton north and they lobbied to elect his main lawyer, Lincoln, an employee of the Illinois railroad company. And since they represented the ‘new machines’ of the Industrial R=evolution, they won the battle against the Virginian planters and gunboat owners of the previous colonial period. In this case, a ‘human cause’ was achieved as a collateral effect of that war. But in the Crimean war, the opposite happened: European powers cynically backed Muslim Turkish, who had enslaved Christian Slavs for centuries, preventing them to reunite with Russia. Since the real reason was the slump in steel and weapons’ industries, taking place in the righteous, racist Empires of England and France, who have never recognized their many war crimes. In the same age, in Prussian Germany wars broke to unify German people, after an economical unification had been successful. But again, it was all an excuse to lay down railroad tracks, as William let his friend, the emperor of Austria, in power. Thus, we conclude that ‘human causes’ are always an excuse for profit wars. This is obvious observing how the biggest Industrial Empire of that age, Britain, went to war, to keep churning steel, defending often opposite concepts: The British backed the reunification of Italy, but they also backed Turkey against the Russian attempt to liberate and reunify with Crimean Slavs. So really, one must conclude that Britain just wanted to sell weapons in both wars and show the world she was still the boss, in his 3rd decadent age of Steam Power. So after the 29 crisis the same German factories that made luxury cars, which no longer sold, made tanks and Mercedes five folded profits. And the world entered war. Finally, in the III cycle, the mini-crisis of 1991 and the electronic crash of 2000, implemented 2 Desert Storm wars that confronted the leading economical culture of the cycle, Jewish-Calvinist America against the last surviving, non-technological culture, Islam. Again, the excuses are historic, territorial rights that we ‘choose’ as we see fit: In Palestine, we consider that Muslims have no rights and Jewish do. In Kuwait, an Iraqi province for 8 millennia, split into a country by British Petroleum to get oil rights to the Kuwaiti fields, we consider Iraq has no rights, because it suits our oil companies. And so the world enters a III World War, with multiple fronts in which to essay our robotic weapons and drones, against Farmers if it doesn’t blow itself up, creating the ‘Singularity’, which is what will happen unless ‘human beings’ disconnect ‘big-brother TV-smiley’, which has them hypnotized into a passive state of idiocy and r=evolve, creating a world made to the image and likeness of Mankind .